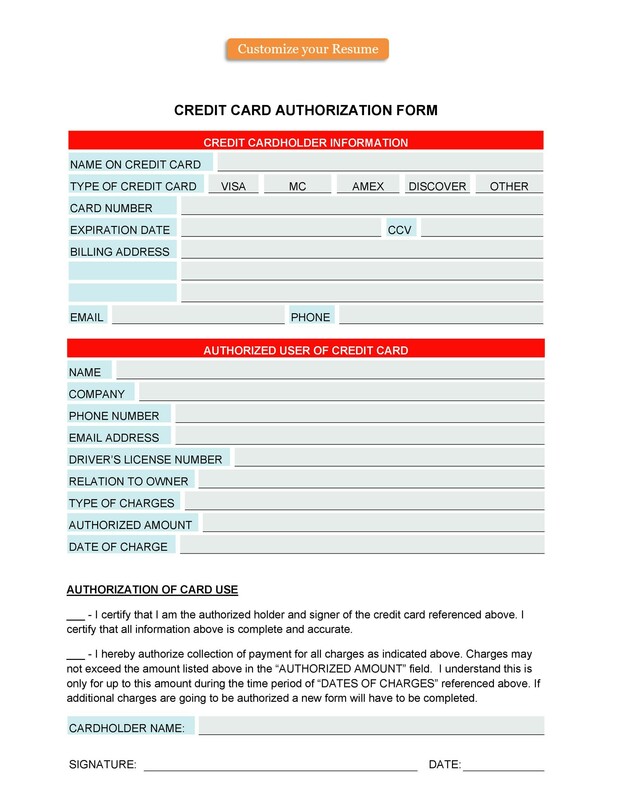 Credit card authorization forms are very important. 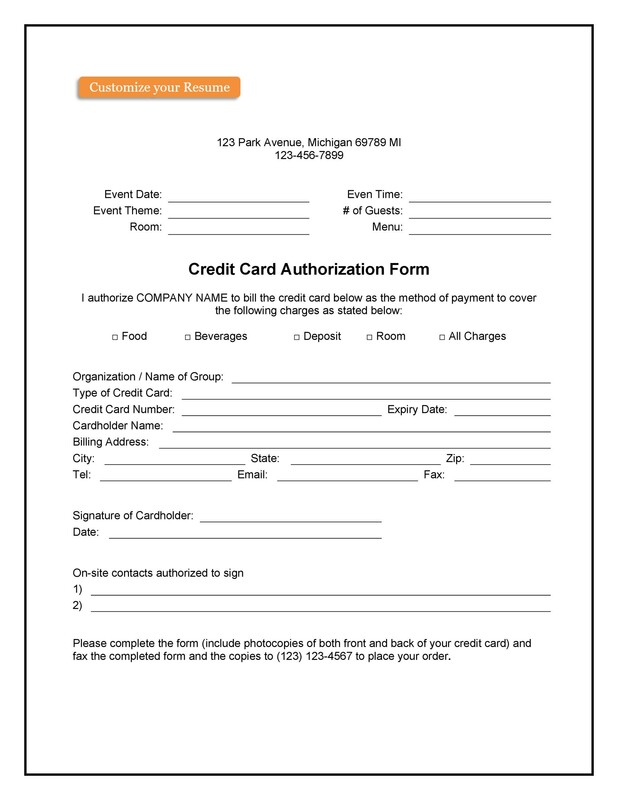 If you’re a business owner, you may accept payment through credit card. But when the card isn’t physically present, there’s some degree of risk. One of the biggest risks is of chargebacks. Fortunately, you can protect yourself from such risks. 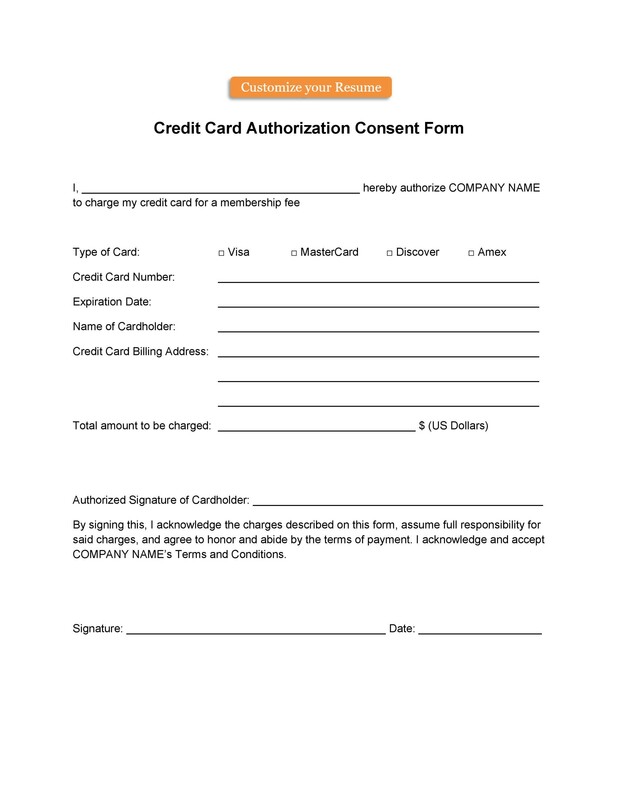 Ask your customers to sign the authorization form for credit cards. This will signify that the owner of the credit card grants you consent to charge their card. 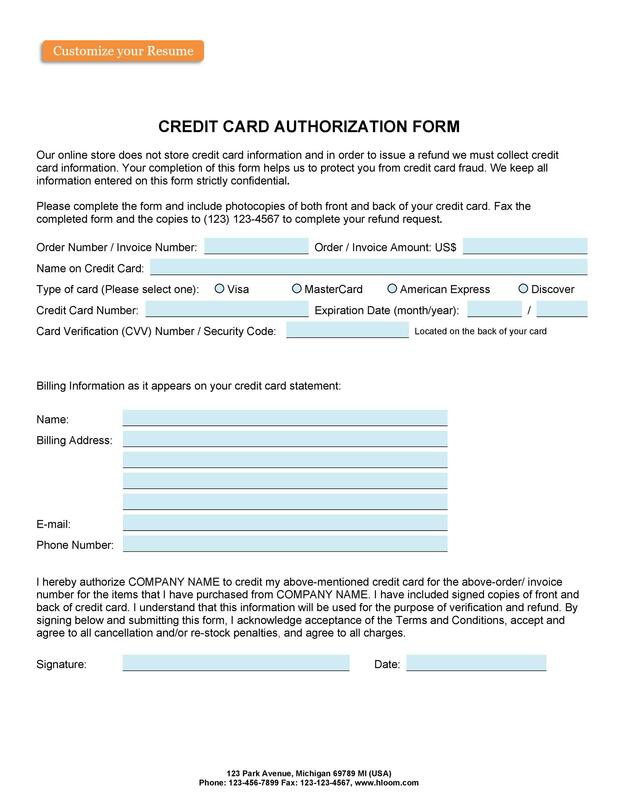 6 When do you use a credit card authorization form template? 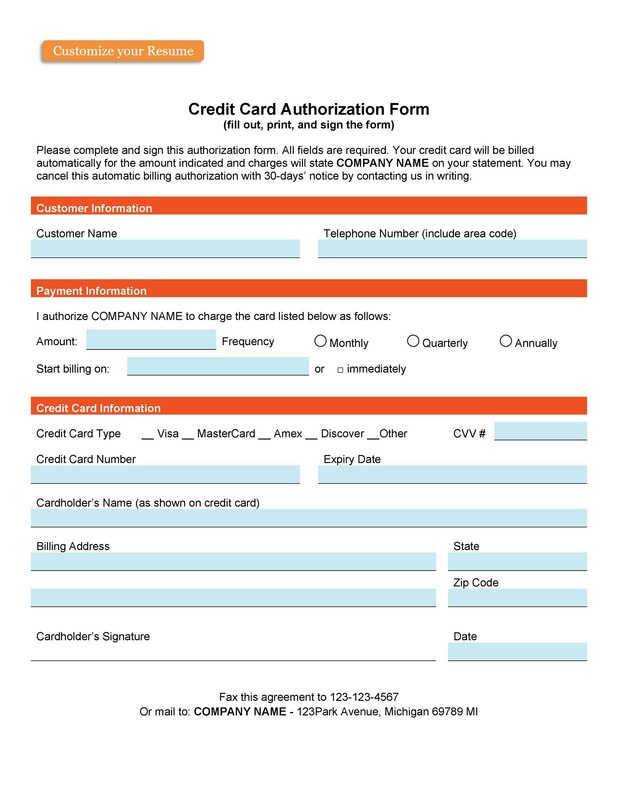 A credit card authorization form is an official document. 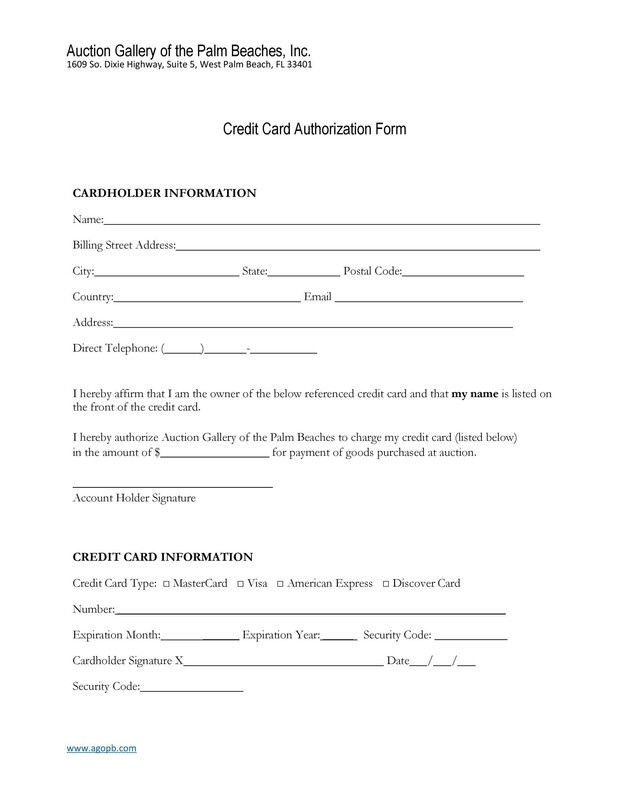 The cardholder signs the document to grant permission to the merchant. Then the merchant can charge a fixed amount on the card for a specific amount of time. 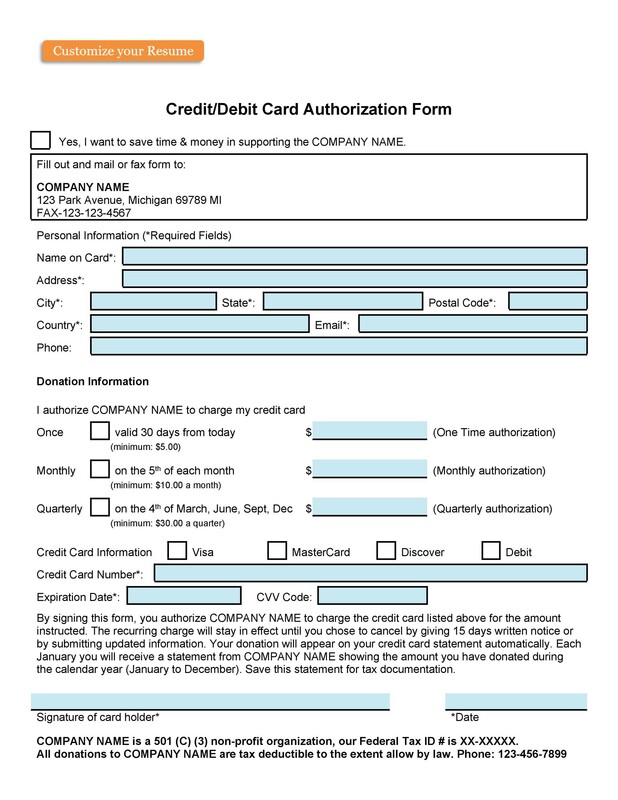 Such form is typically used by businesses so they can charge a cardholder on an ongoing basis. So they may charge the amount monthly, per quarter or even intermittently. Such form is also important to avoid chargebacks. A chargeback happens when a customer disagrees with a charge from the business. Then he asks the issuer of the card to reverse the transaction. Chargebacks can bring about big problems for businesses. This is mainly because disputed funds are usually held from the business. That is until the issuer of the card makes a decision about the dispute. These occurrences are also very time-consuming. Also, you’d have to do lots of paperwork when they happen. Therefore, you can use such form to protect yourself and your business. 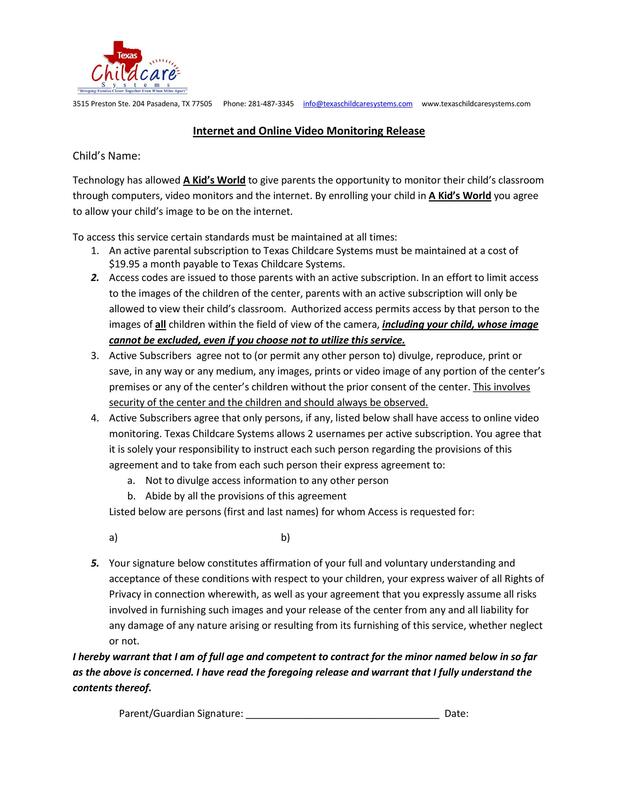 You need to let the customer sign the form. Then you’ll have proof that the cardholder gave you permission to charge the card. So if the customer makes a dispute, you can present the form and win the case. 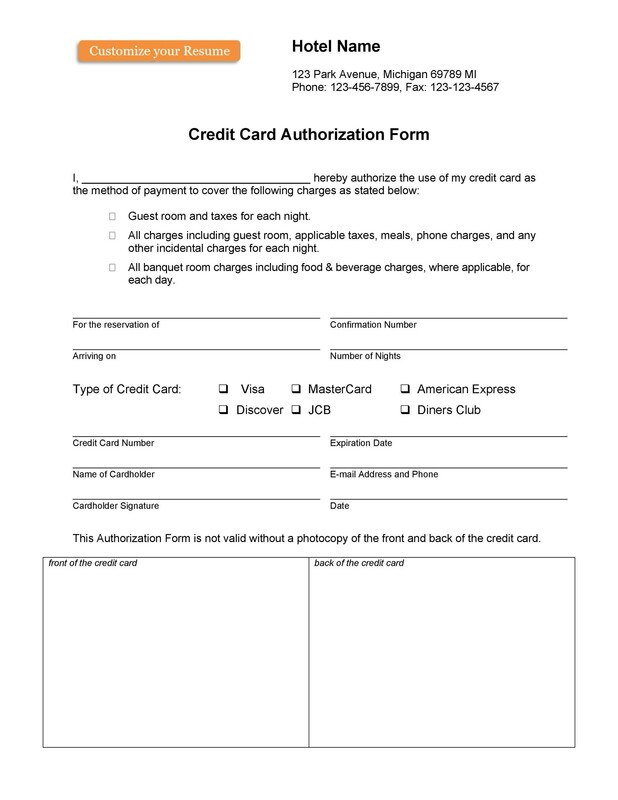 A credit card authorization form is a legal document. 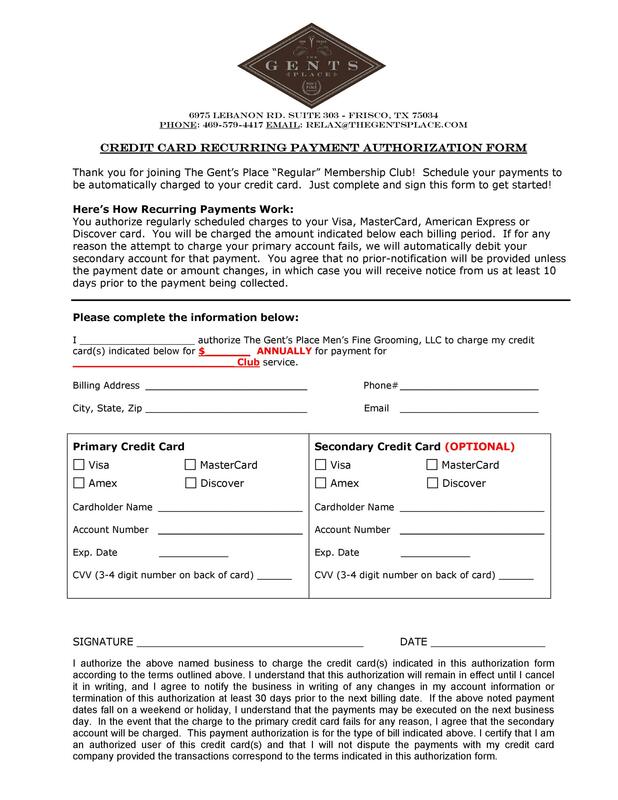 The cardholder signs it to grant permission to the business to charge their debit or credit card. You can use it for a single transaction or for recurring charges on the card. 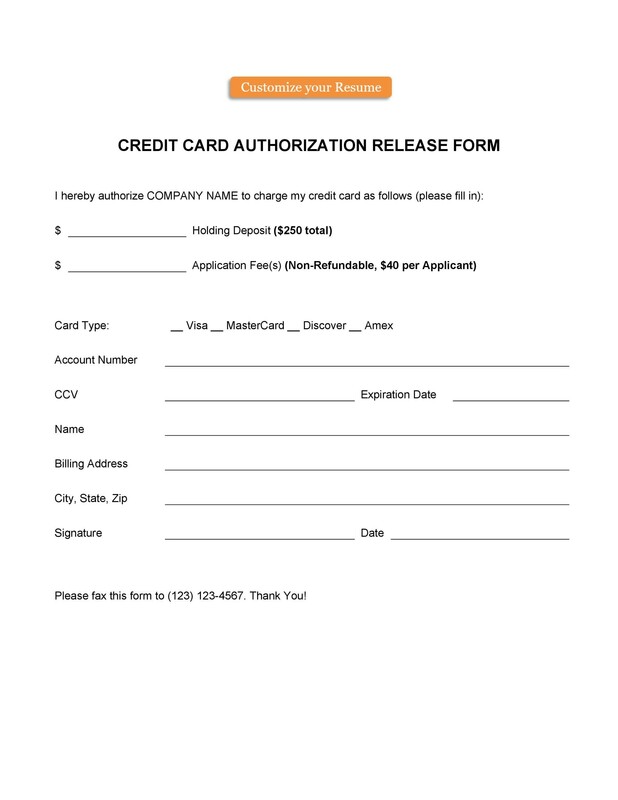 The signed form helps safeguard your business from chargebacks or any financial problems. 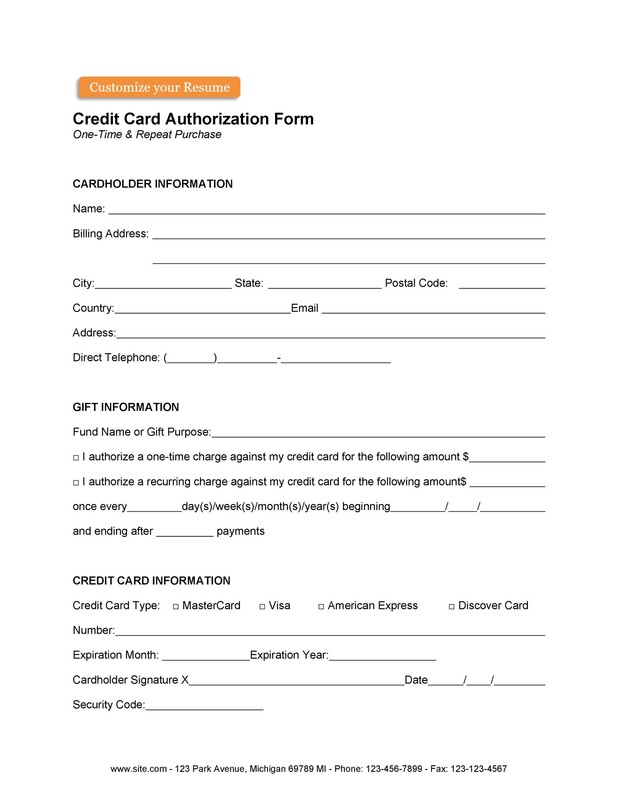 This includes the cardholder’s full name and billing address. 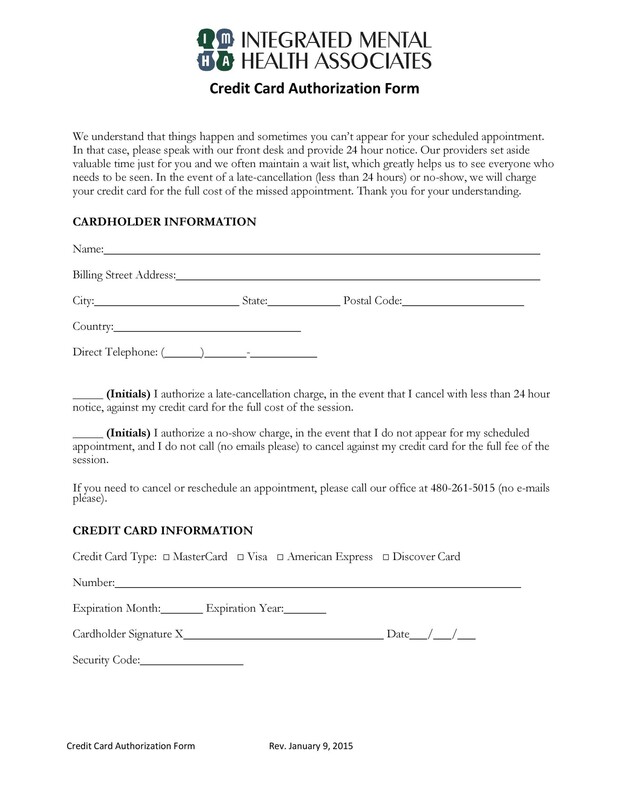 It would also include the contact information of the cardholder. This includes the type of credit card (Mastercard, Visa, etc.). Also, include the credit card number, expiration date, and the security code. 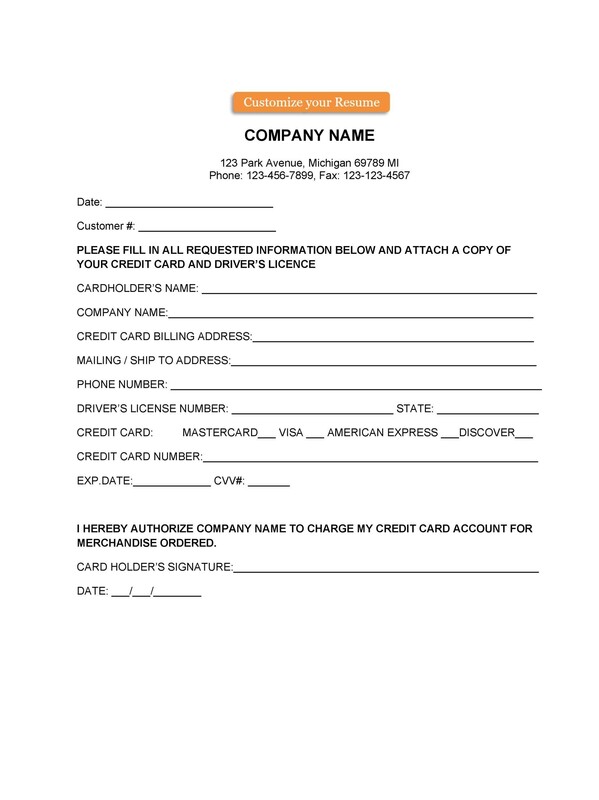 This includes the name, address, and contact information of your business. 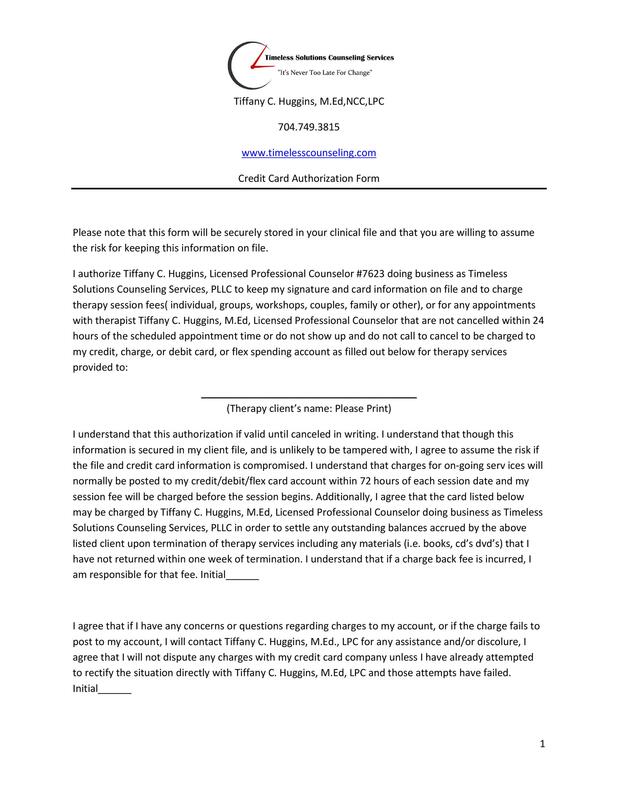 Include a statement of authorization which applies to your business. Also, you may include the type of transaction, whether single or recurring. Think of a good statement which will give you the authorization to you. 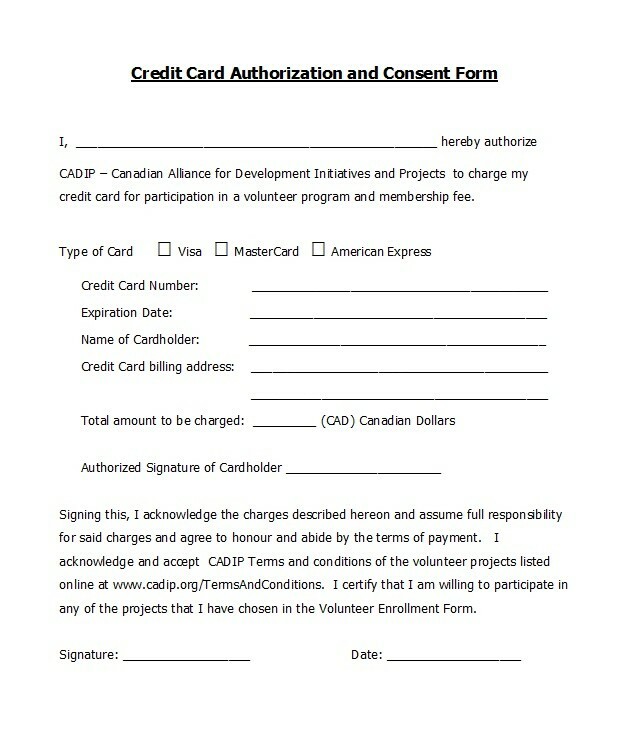 To make the document valid, the cardholder should sign and date it. 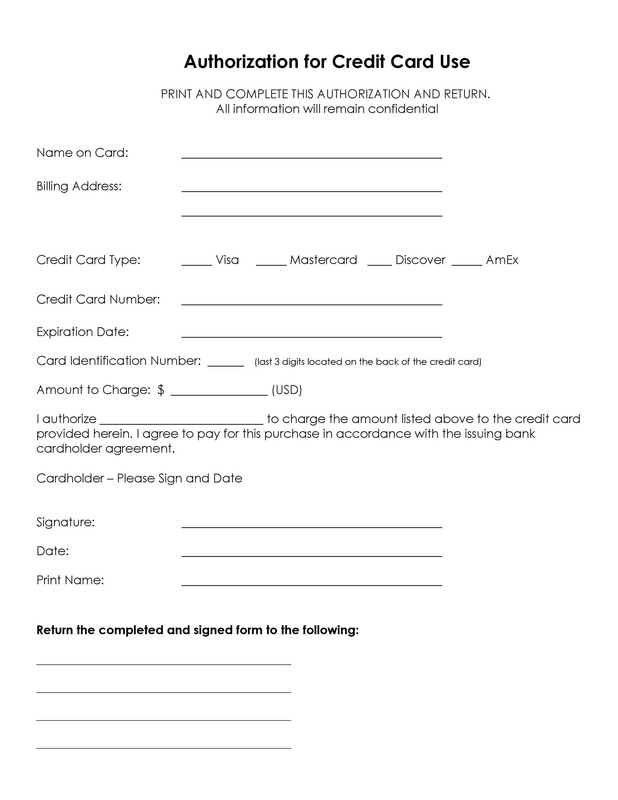 So you need to include a space for the cardholder to affix his/her signature. As you can see, such forms are really important. You can make a template for your business or download one from here. 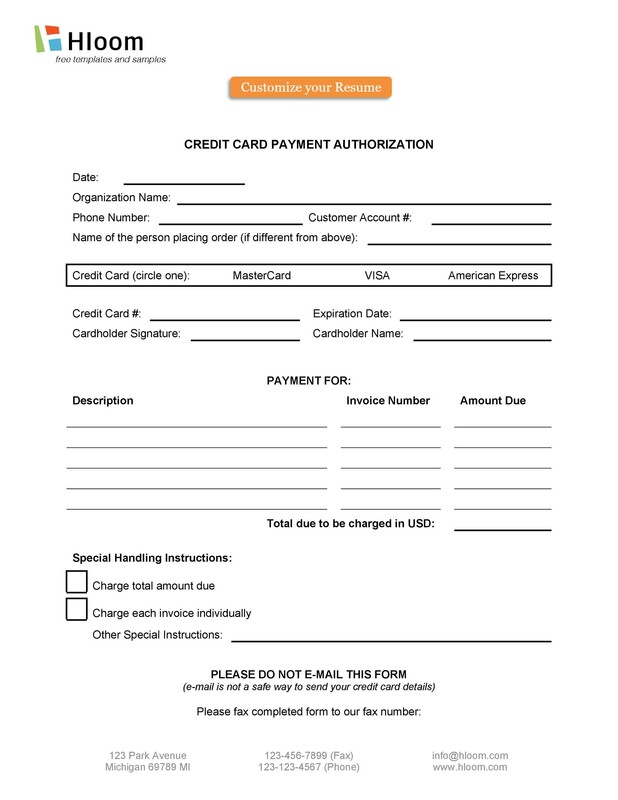 If you’re accepting payments via credit card for your services, then you need such a template. This type of template is simple and basic. You’ll use a standard template which is universally accepted. So you can use this type of template for different kinds of purchases. 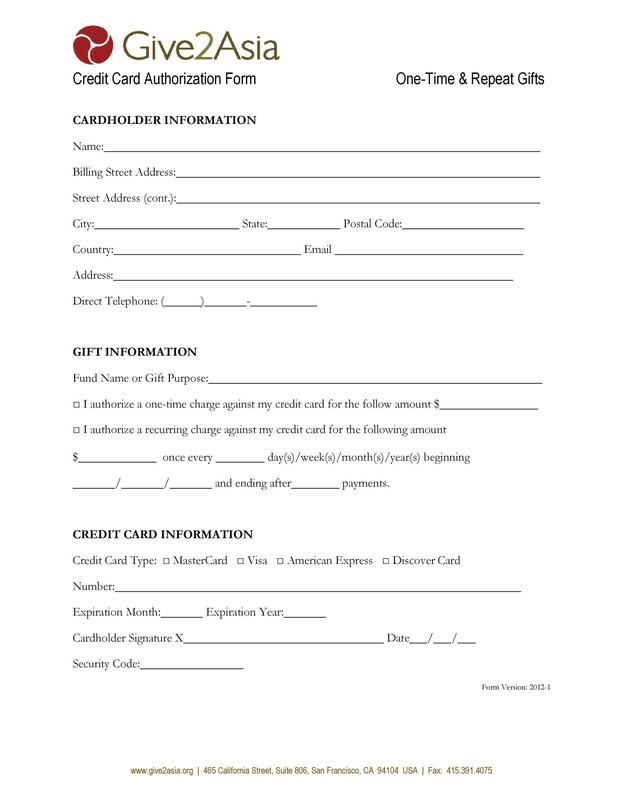 This template is specifically designed for recurring payments. 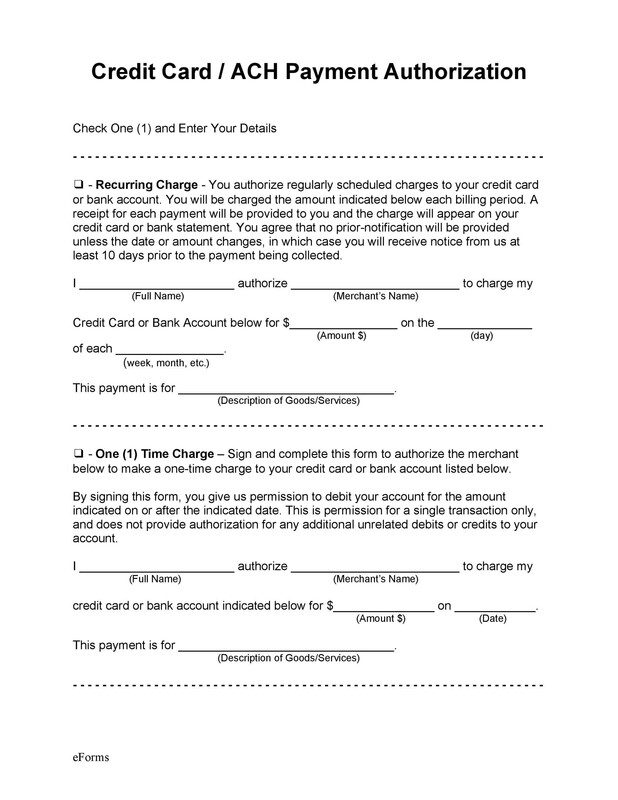 So when you’ll charge a recurring payment to your customers, you can use this form. 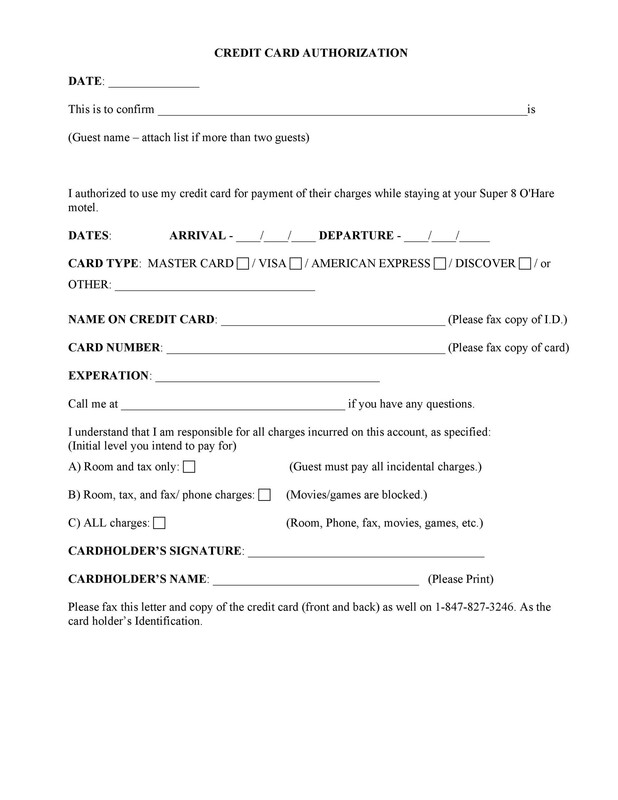 Include details which pertain to such payments. These include the amount and the frequency of the charges. You can also create or download blank templates. These are very convenient because you can use them for different purposes. So whenever you need a specific template, just modify the blank one. Add or remove the information as needed to make it fit into the payment situation. 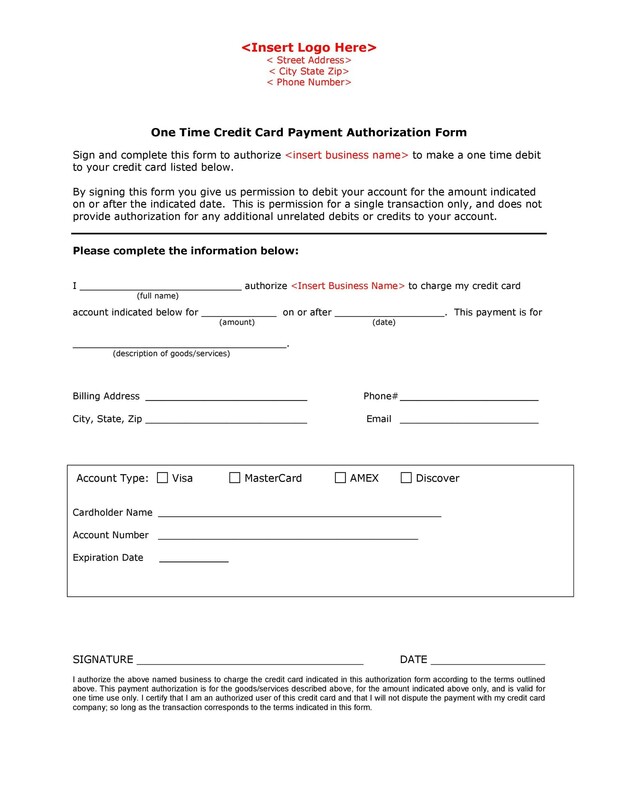 If you only allow for one-time payments, you can use this template. 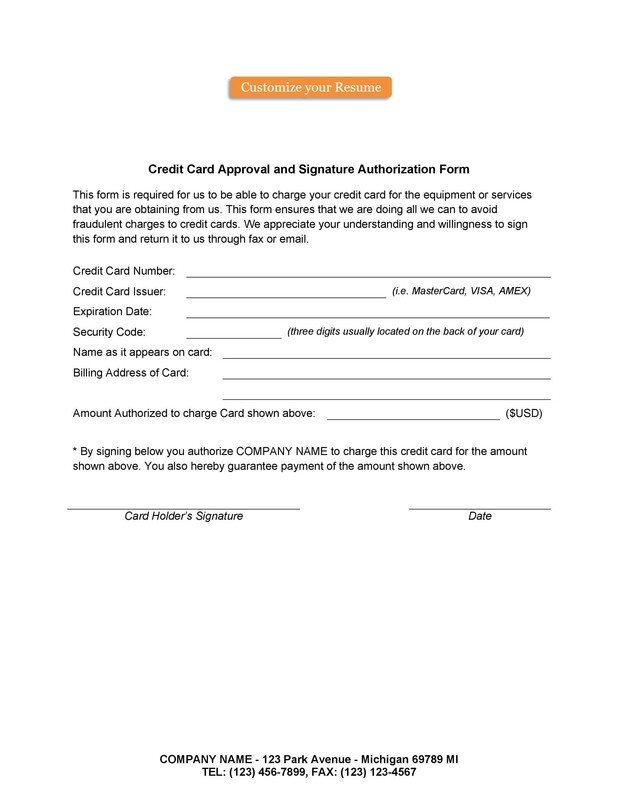 When you ask your customer to sign this template, then it’s only valid for one transaction. This is a simpler template which doesn’t require a lot of information. This template is quite similar to the standard template. With it, the customer will give you the authority and consent to charge his/her card. You can make the template as simple or as complex as you want. Just make sure it will include all the relevant information. Since these templates are fairly simple, they’re also quite easy to use. When you’re using such forms for different purposes, make sure to check the format of the template. 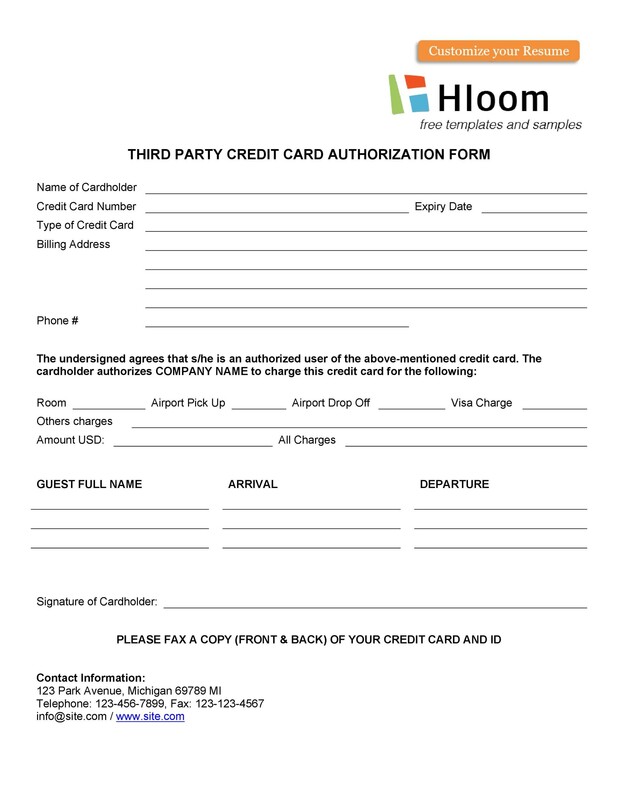 Don’t give a customer a recurring authorization form. That is if he wants to perform a one-time transaction. Since there are different types you can use, be sure to use them appropriately. The same thing goes if you’re planning to download the form here. Check the format to see if it suits your needs. Once you’ve created or modified your template, check it first. Do this before you print it out. Make sure the template is free of errors as it’s a legal document. The smallest mistake can nullify your form so it should be completely accurate. Be careful when creating the form and proofread it first before printing. Usually, downloadable templates come in a standard format. One which is universally accepted everywhere. So if you download a template, you don’t have to worry about mistakes in the wording and formatting. Of course, it’s still a good idea to check the template before using it. You can use the template as a basic framework then just edit it as needed. 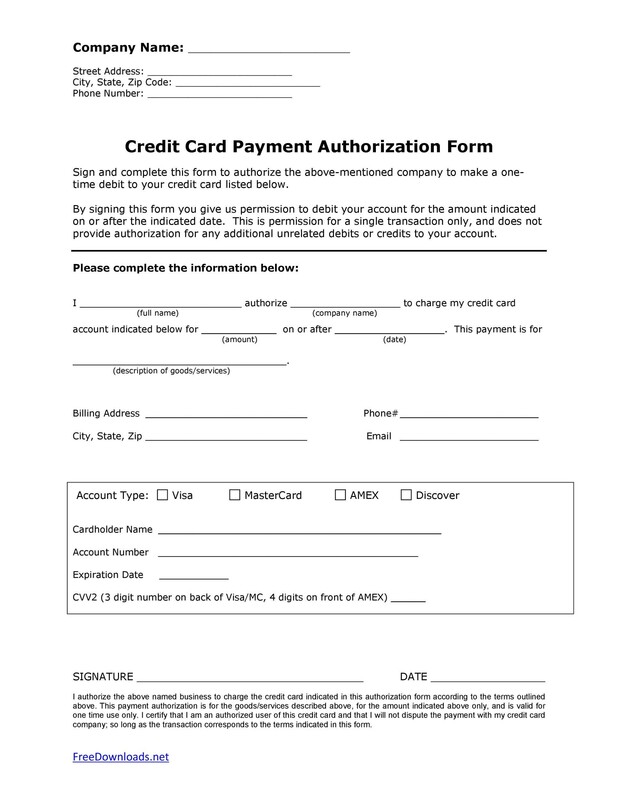 When do you use a credit card authorization form template? 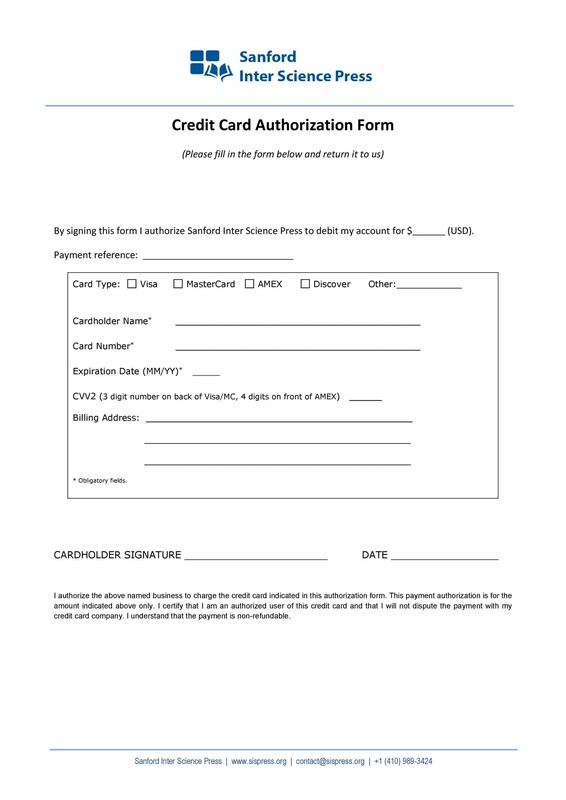 Use the form if the cardholder isn’t physically present during the transaction. For instance, if your customers place orders online, through email or over the phone. That’s why these forms are very beneficial. They’re essential for businesses which don’t have traditional shops. If your business doesn’t operate with a physical infrastructure, authorization forms are essential. 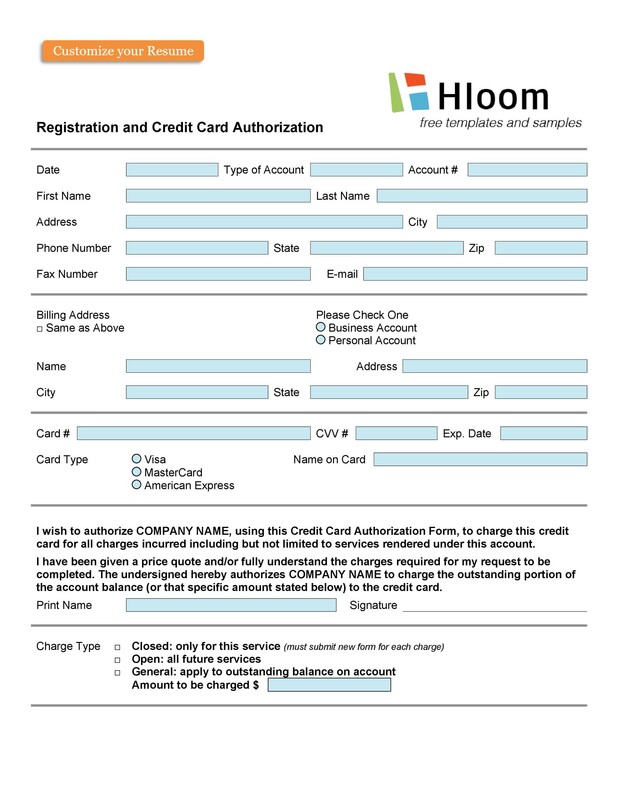 You can also use the form for credit card billings which will occur in the future. When you perform the transaction, the customer’s credit card doesn’t get charged. Instead, the sale has a pending status in the account of the cardholder. This is typically known as “authorization only” transactions. 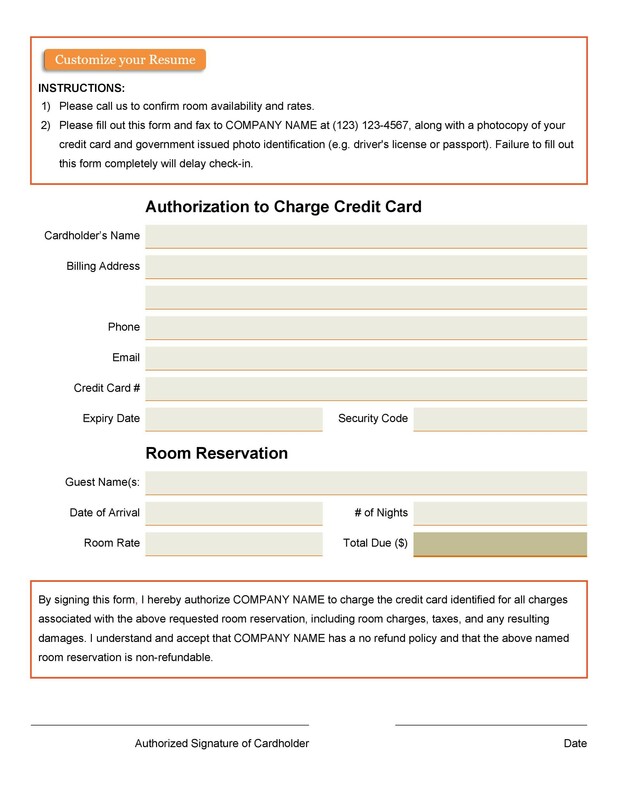 These types of transactions are common with car rental companies and hotels. Also, the initial charge may also get adjusted. That’s based on the actual cost which the cardholder incurs for the services. You can also use this kind of transaction when a customer wants to put an item on hold. This applies when the item the customer wants isn’t in stock. 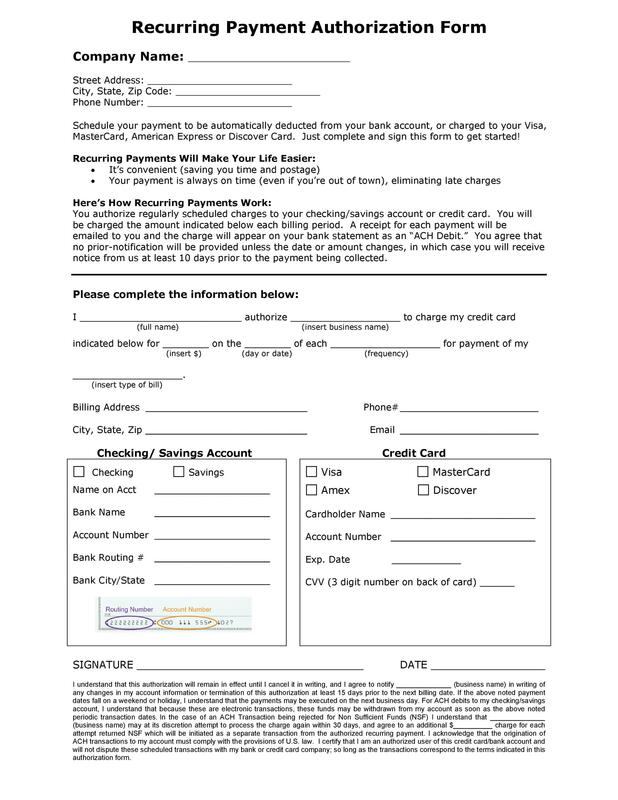 Finally, you can use the form for authorizing recurring or ongoing payments. These are also known as “card on file” transactions. This is when the cardholder authorizes the business to charge for recurring payments. One example is for subscription-based services. 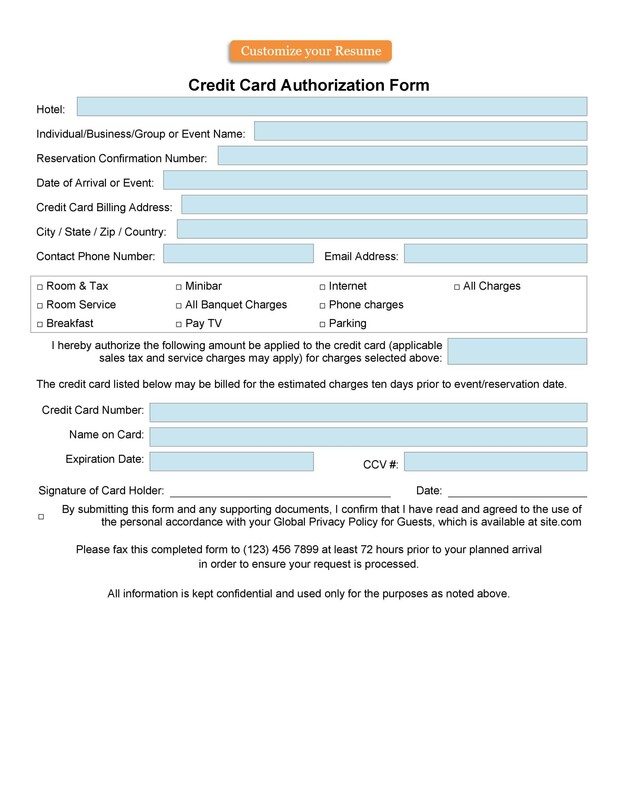 Each month, the subscriber can charge the cardholder for the subscription. This is a more convenient option as it automates transactions for repeat customers. When you’re dealing with customer payments, things can get complicated. Nowadays, a lot of customers prefer to pay using a credit card. 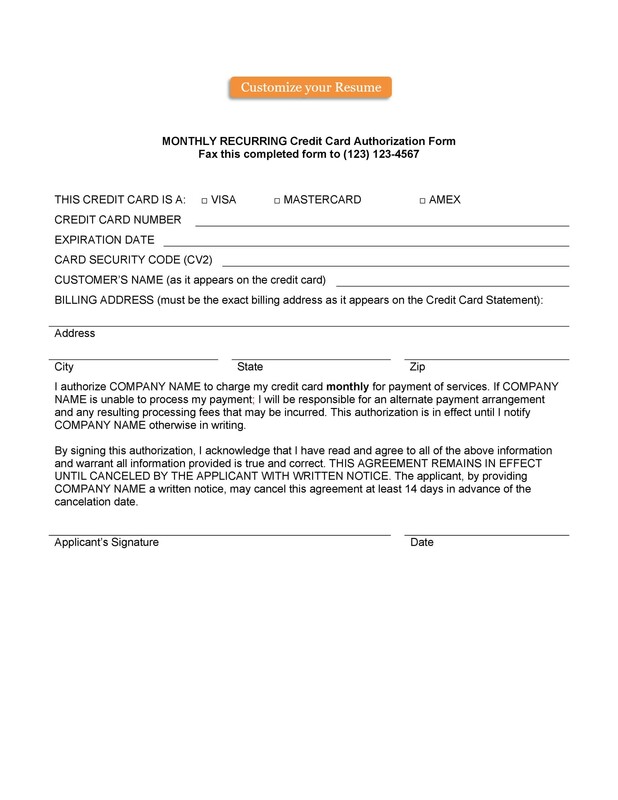 So it’s important for businesses to create and use credit card authorization forms. You can create your own template or even download one from here. 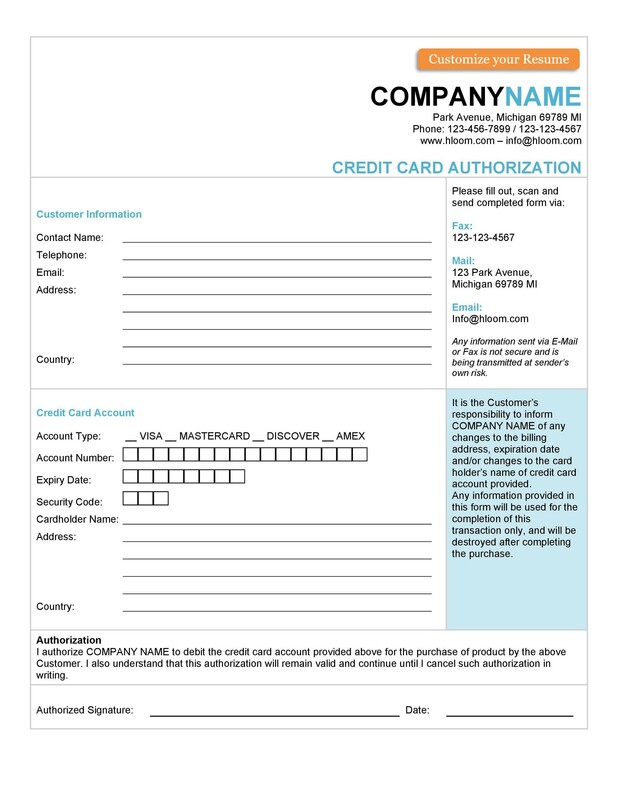 This template contains all the important information needed on the form. Then all you have to do is modify the information as needed. 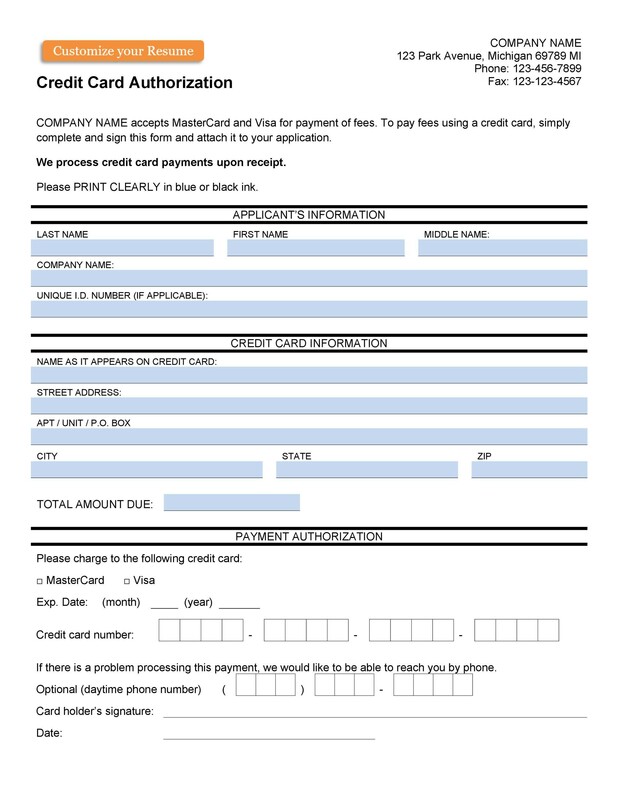 You can use the form to collect the information about the customer and the payment method. This is a lot more efficient than asking your customers to fill out several forms. This will help improve the process and reduce the documentation you store in the office. It can also simplify the record-keeping process for your business. 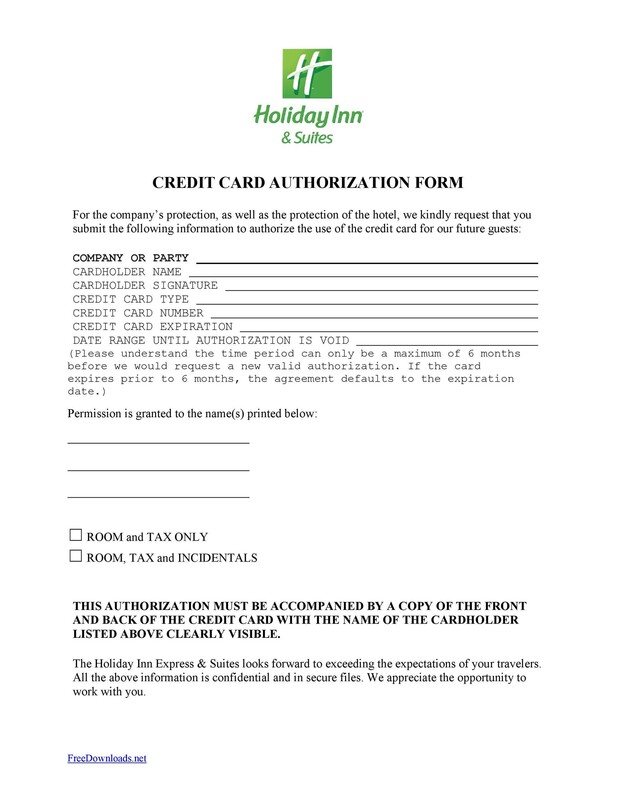 It’s not enough to write the payment details of your customers on any piece of paper. 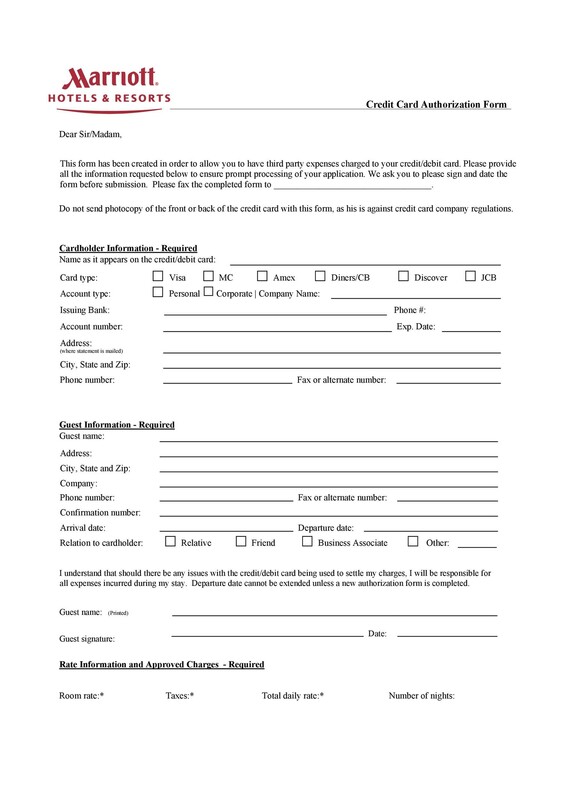 You need to give your customers a proper form to sign. This will help instill confidence in the cardholder and build trust as well. A well-designed form will also show your commitment and professionalism. 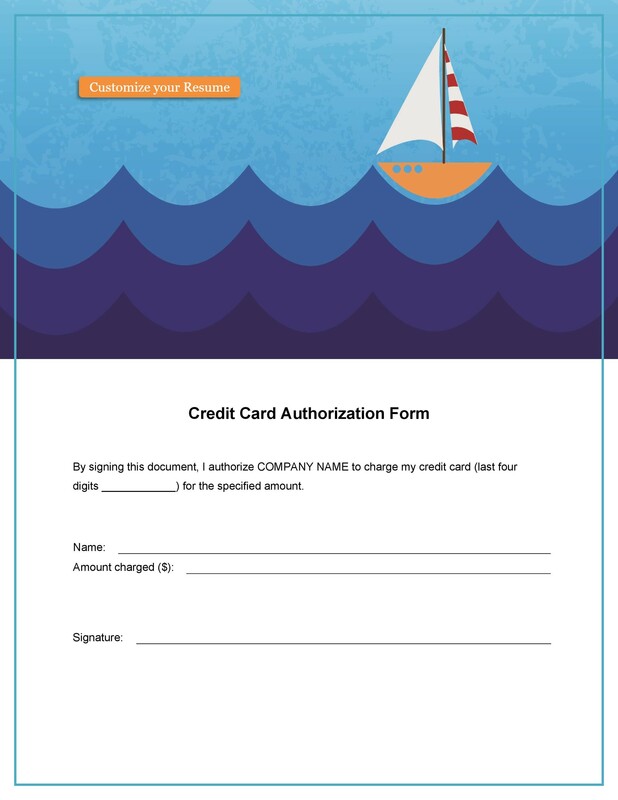 It will show your customers that you properly document transactions. We’ve already mentioned how such forms can help protect your business. This is a huge benefit as no one wants to become a victim of fraudulent activity. Credit card payments usually come with risks. But using an authorization form can help reduce those risks. When the customer signs it, you’ll feel more confident about the transaction’s validity. 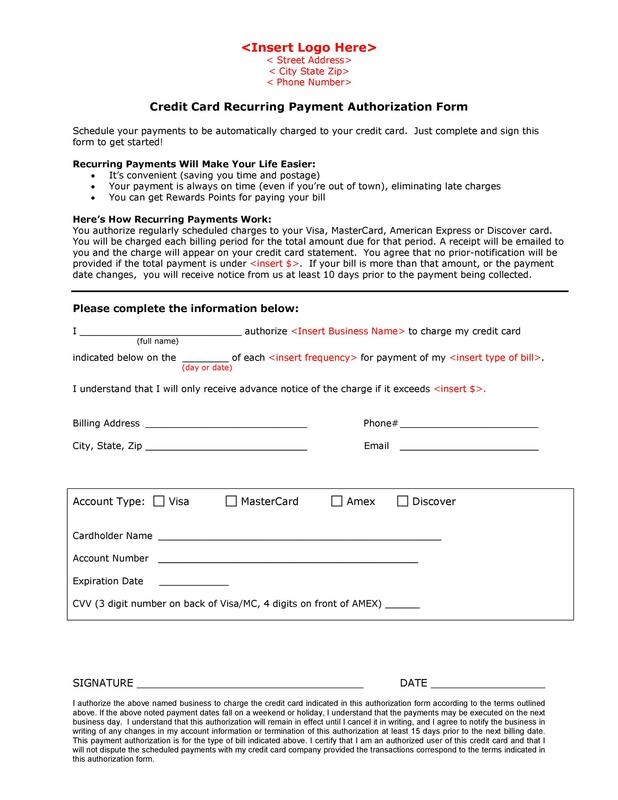 Credit card authorization forms are truly useful. You can’t go wrong when you use an official document for your business. Without this, you run the risk of putting your business in financial jeopardy. When performing transactions, never store the security code data of the customers. It’s against the rules of card associations. If you choose to include the security code data of your customers, take care of the information. Otherwise, there’s a huge risk of identity theft. If you aren’t able to protect such sensitive data, it could mean huge problems for your business. After the transaction goes through, email the sales invoice to your customer. It should include the details of your business. Also, include the details of the product or service that the customer purchased. These include the price, quantity, and description. In your email, also include your cancellation and refund policies. 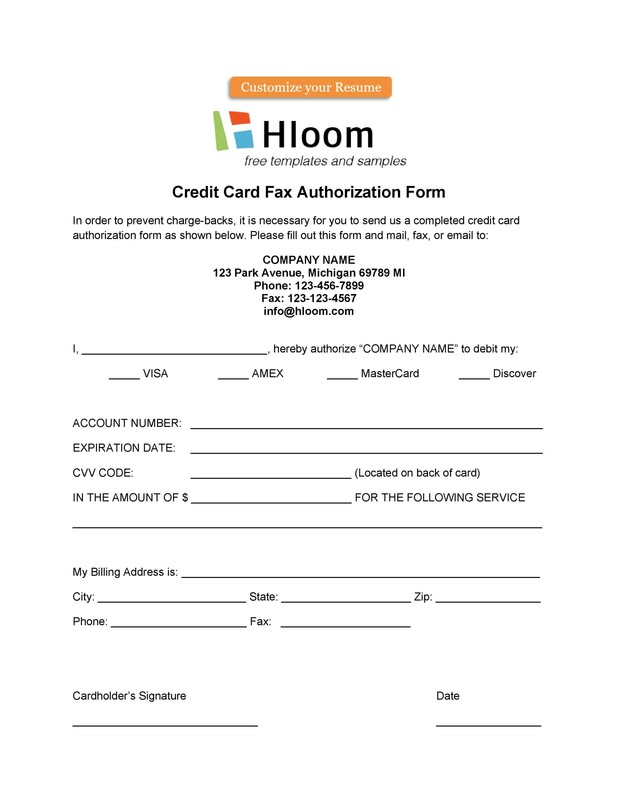 It’s not a good idea to ask your customers to fax back the form. Instead, tell them to make their payment on an online page that’s secure. Usually, the page includes fields for all the relevant information about the customer. What you can do is to add a checkbox to the form. 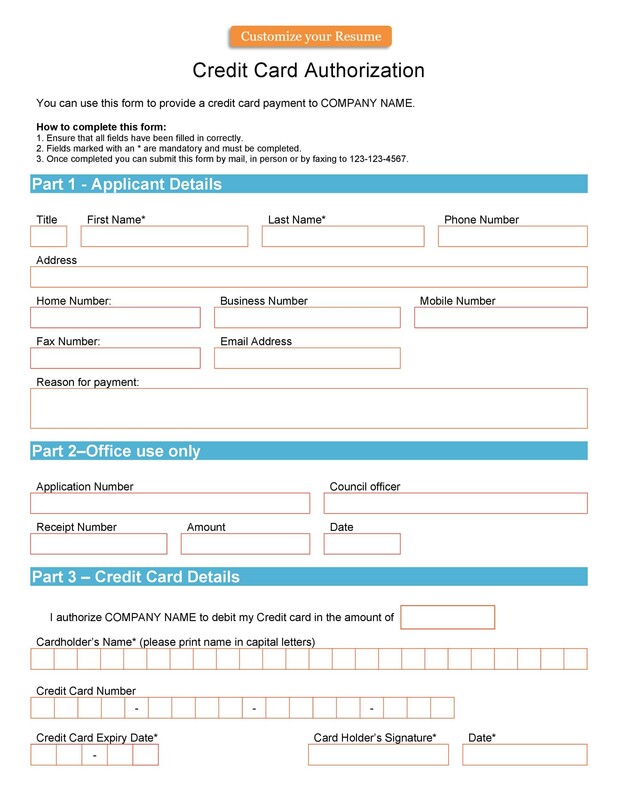 This is for the cardholder to acknowledge the receipt of the form. Also, the customer can accept the terms of your invoice. There may be cases when the billing and shipping address differ. In such cases, you may need to ask the customer to send a separate document. One which states that he/she authorizes you to ship the items to a different address. Such situations are common for business to business transactions. 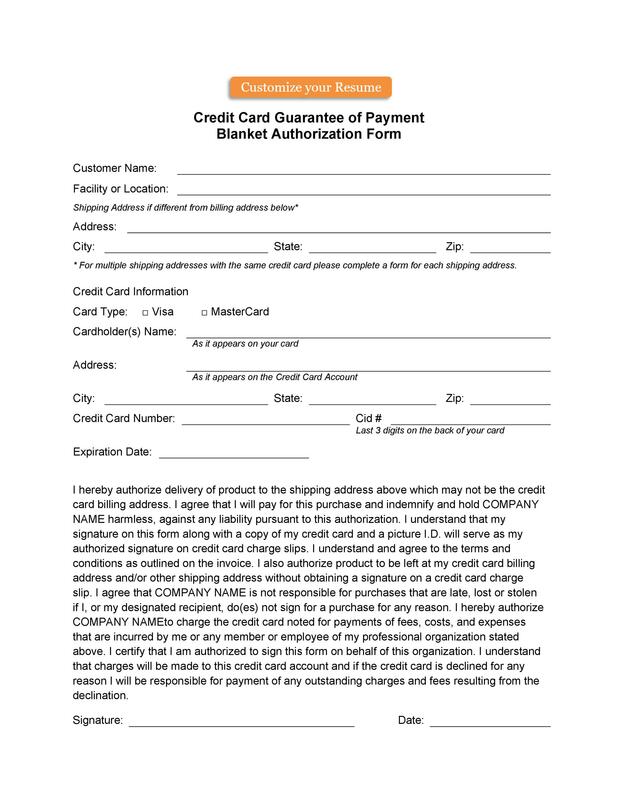 You need the document to prove that the customer authorized the shipment address. Instead of signed faxes, you can ask the customer to reply to you through email. 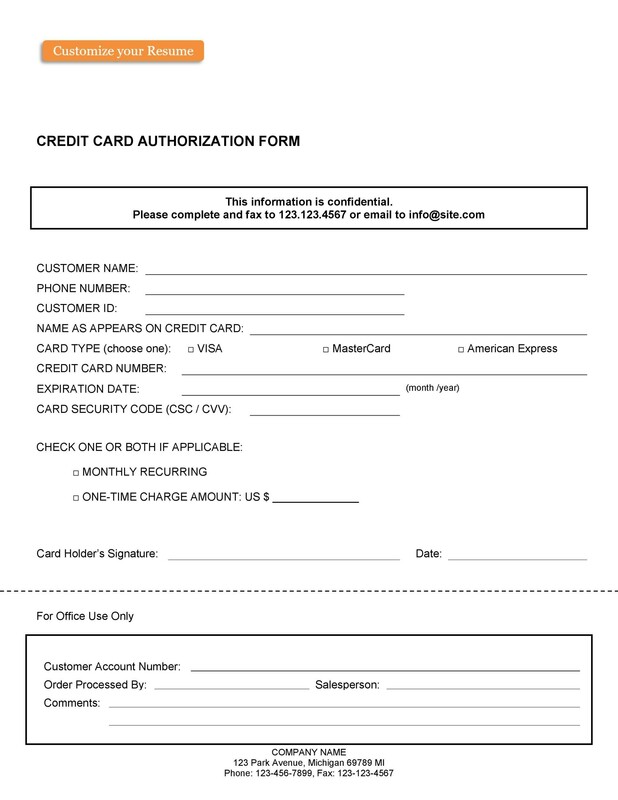 The customer can then acknowledge the receipt of your form. Then the customer can also send the authorization code. You can use the code as proof when the need arises. There’s one important thing to keep in mind when dealing with authorization forms. You need to have everything in writing. This is important when situations escalate and you have to appear in court. You need to have all your documents in order so that you can defend yourself adequately.